A special part of our Sunday worship is provided by the wonderful musicians who bless us with their gifts. Ensembles include Chalice Choir and contemporary band, both under the direction of Susan Peck, a dulcimer ensemble, and a pastoral care/justice choir. 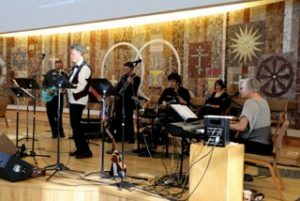 On other Sundays, First Unitarian welcomes guest singers, instrumentalists, and performance groups from the congregation and larger community. We enjoy a wide variety of musical styles in our worship. Our adult choir, the Chalice Singers, fulfills part of the church’s mission through religious education, mutual support, social bonds, and the search for authentic expression. They sing repertoire supporting UU principles and beliefs, evoking an emotional understanding of these ideas. The Chalice Singers perform monthly at both Sunday services from September through May. Rehearsals are in the sanctuary, from 7:00-9:00 pm on Thursdays from August through May. No audition is necessary, and church members and friends ages 14 and older are welcome. While singing experience is helpful, it is not necessary. Choir members only need the ability to match pitch, willingness to learn, and commitment to attend weekly rehearsals. If you’re unsure of your vocal range, come 15 minutes before rehearsal to check in with the director. You can email speck@uuabq.org with questions. The choir is a great way to make new friends in the church, with social opportunities throughout the year—we’d love for you to join us! Spare Parts is our church’s contemporary band, made up of church members. The band rehearses on Wednesday evenings, and plays in worship on the first Sunday of the month. Participation is by invitation; we hold occasional jam sessions to get acquainted with new musicians. 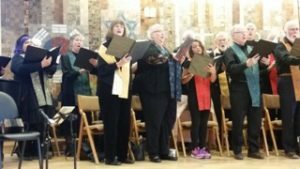 Sol Singers is a group for all ages and abilities to “learn music by heart; take love to the community.” This intergenerational chorus learns music in the aural tradition, with repertoire drawn from UU hymnals, folk traditions, world music, pagan chants, justice songs, and healing tunes. Singers are invited to suggest songs for the group to learn. The Sol Singers are available to make pastoral care visits in the community, bringing the healing power of music to those in need of comfort. Sol Singers meet 5:00-6:30 pm every Monday in the Social Hall. First U’s chamber music group meets at members’ homes once a month on a Sunday afternoon to read and play classical trios, quartets, and other chamber music. We welcome string, wind, brass, and keyboard players at all levels of playing ability. If you play a transposing instrument, let us know in advance so that we can find or create a part for you. Repertoire ranges from early intermediate to easy advanced. Group leaders are Susan Peck, Marilyn O’Boyle, and Becky O’Boyle. Most mornings before worship and children’s and youth Religious Education classes, children and families gather in the RE foyer or church courtyard for 15 minutes of singing together led by a group of volunteer song-leaders. If you’re interested in joining the song-leaders, contact Susan at 884-1801 or speck@uuabq.org. The Director of Music is in charge of arranging musical performances for worship. She generally auditions musicians, often by going to a concert or listening to a CD. Please call the church office at (505) 884-1801 or e-mail her for more information. Musicians provide music for both of our Sunday services (9:30 am and 11:00 am). The prelude begins 15 minutes before the start of the service as people arrive. This is a quiet time in the Sanctuary, and church members will give you their full attention. The order of service includes a musical interlude and an offertory. The Director of Music will work with you to select pieces that complement the sermon theme. Musicians who are church members usually donate their time, while visiting musicians are paid for their service. Guest musicians may sell CDs during coffee hour at a table in our courtyard or foyer.